1. Tesla rally: Shares in Tesla (TSLA) are surging 8% premarket as investors express relief that the company's big quarterly loss wasn't as bad as expected. Tesla reported its largest quarterly loss in its history on Wednesday and burned through $430 million in cash over three months. The electric carmaker said it lost more than $717.5 million in the second quarter. But its cash burn rate was less than investors expected, and the company had $2.2 billion in cash at the end of the quarter. 2. Trade scare: The latest flare up in global trade tensions is hitting China's stock markets. The Trump administration announced it is considering more than doubling tariffs on an additional $200 billion worth of goods from China. US tariffs could be set at 25% instead of 10%. The main Shanghai Composite index fell 2% as investors reacted to the threat. The Hang Seng shed 2.3% and the Shenzhen Composite dropped 2.4%. Data released this week suggested that the Chinese economy is already starting to feel the pain from recently introduced US tariffs, prompting further investor concern. So far, the United States had slapped 25% tariffs on Chinese goods worth $34 billion to punish Beijing for what it says are its unfair trade practices. 3. 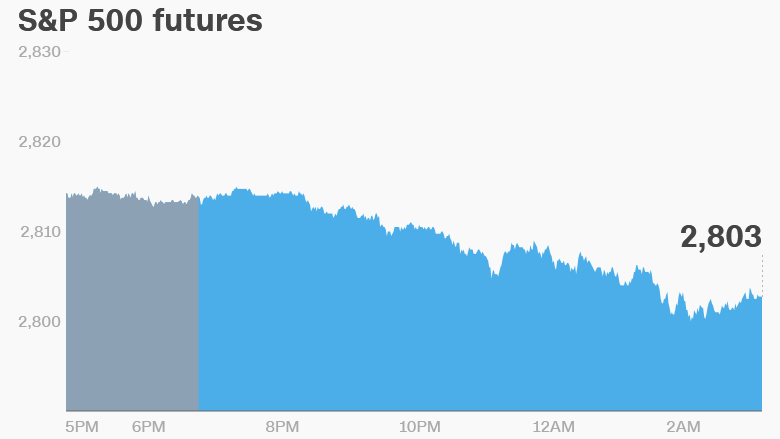 Global stock market overview: US stock futures were lower. European stocks dipped in early trading, with Germany's Dax down 1.5%. The Dow Jones industrial average and S&P 500 had a rough Wednesday, slipping 0.3% and 0.1% respectively. The Nasdaq was more buoyant, rising 0.5%. The yield on 10-year US Treasuries have stuck around 3% after rising to that level on Wednesday. 4. Earnings galore: It's another big day for earnings in the United States. Ahead of the open, investors will hear from Blue Apron (APRN), Cigna (CI), DowDuPont (DWDP), Kellogg (K), MGM Resorts (MGM), TransCanada (TRP), Wayfair (W) and Yum! Brands (YUM). Cigna was in the news on Wednesday as the Wall Street Journal reported that activist investor Carl Icahn built a sizable stake in health insurer. CBS (CBS), Activision Blizzard (ATVI), Take-Two (TTWO), GoDaddy (GDDY), GoPro (GPRO) and Shake Shack (SHAK) will report quarterly results after the close. BMW (BMWYY) stock slumped 2% after the German automaker reported its quarterly results. 5. Central bank action: The Bank of England is widely expected to hike interest rates on Thursday as high inflation and a strong job market encourage the central bank to clamp down on cheap money. The decision is expected at 7 a.m. ET and economists are expecting the central bank to raise the benchmark rate to 0.75% from 0.5%. "The BoE looks almost certain in our view to raise interest rates for the second time since the global financial crisis," said Fawad Razaqzada, a market analyst at Forex.com. The US Federal Reserve held rates steady on Wednesday.